Manchester Orchestra has always received a fair amount of hate. Their 2006 debut, the awfully named I’m Like a Virgin Losing a Child is definitely a love/hate record for nearly all who give it a listen, with a majority of the indie community leaning towards the “hate” side. I understand where they’re coming from — Andy Hull’s voice can easily be considered annoying, and lyrically, you won’t find a more melodramatic band out there. Funnily enough, those are the two things that sucked me in and have kept me a fan to this day. Hull’s whiny voice and blunt self-pity are sometimes just what a teenager needs when wallowing in the sea of misery that is high school. I’m only half-joking with that last sentence. We can all be a little dramatic at times. Anyway, I noticed that on Manchester Orchestra’s sophomore album, Mean Everything to Nothing, they moved away from what I loved about them. That record sounds more like some weird emo-metal hybrid than anything, and I didn’t like it. I wanted the vulnerability that came with their debut back. Fortunately, Simple Math is a step in the right direction. 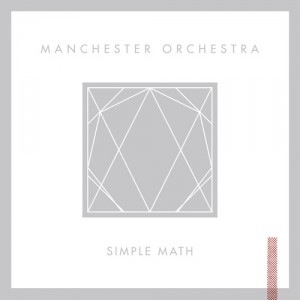 The harder sound that Manchester adopted for their second record still breaks through on Simple Math. Tracks like Mighty Pale and Black Eye bring back the metal sound, with heavier guitars and a greater sense of doom in the lyrics than usual. Ultimately, I’m going to take away songs like Simple Math and April Fool. Both go back to the group’s whiny, drama-filled roots, and that’s what I love.